Have an idea for a blog post? Blogs posts can highlight an event, announcement, or business story. Email hello@corktowndetroit.biz to submit your blog post! PAL’s 50th Anniversary event is a celebration of building character in young kids. Since 1969, PAL has served hundreds of thousands of young people through a variety of athletic, academic, and leadership development programs. Last year alone, each PAL kid spent an average of 65 hours in one or more of PAL’s programs developing the lifelong character building skills of teamwork, sportsmanship, discipline, and perseverance! In celebration of 50 years of service to PAL children this memorable event is raising funds to provide at least an additional 50,000 hours worth of character building opportunity for the future of young children in our community! Every $5 donated provides one hour of character building opportunity for PAL’s youth! 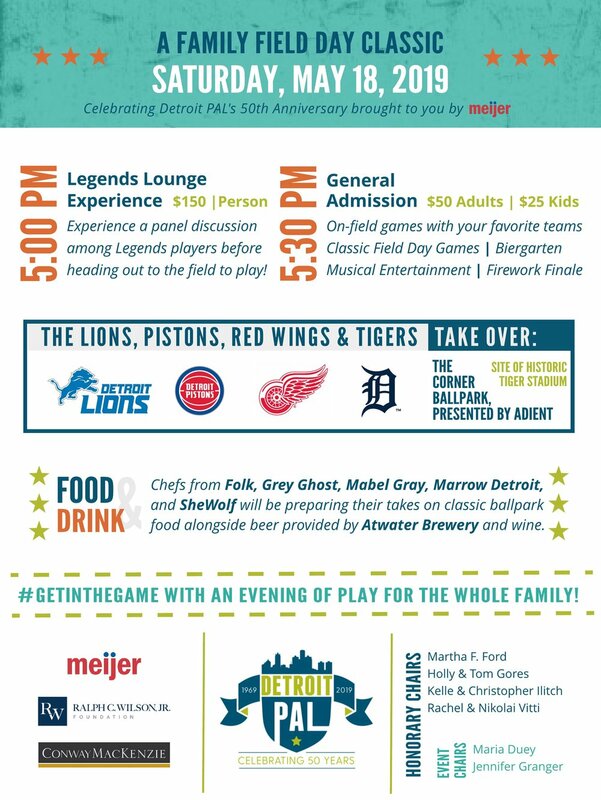 An all-star celebration not to be missed, the Detroit Lions, Detroit Tigers, Detroit Red Wings and the Detroit Pistons will come together and take over The Corner Ballpark for an evening of family-friendly fun with on-field games. Classic field day games such as sack races, tug-of-war, and inflatable obstacle courses will also fill the field. Guests will also enjoy entertainment from local musicians and modern takes on classic ballpark fare from Detroit’s top chefs and a spectacular fireworks display to close out the evening! The Corktown Business Association in Detroit, MI convenes neighborhood business owners to inform and execute a strategic plan that promotes entrepreneurship and growth in our community. As a dues-paying membership organization that meets regularly, we advocate for specific strategies in the following areas: mobility, public safety, green space, and identity.